WILLIAM G. MOORE & SON, INC.
WILLIAM G. MOORE & SON, INC. OF DELAWARE was established in the 1940's and incorporated in 1950, for the purpose of matching worldwide customer's needs for wood products, to the specific mill suppliers worldwide who could best meet those needs. Through all the years, we have represented only those domestic and durable hardwood mills that have met our high standards for quality and reliability. As the environment is a responsibility of our industry, we only use durable hardwood mills that practice sustainable forestry. 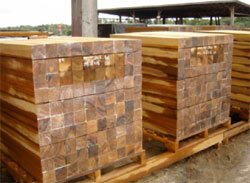 We have supplied everything in the lumber line from timber, piling, poles, decking, railroad ties, bench slats, and prefabricated bridge sections in the species of Douglas Fir, Hemlock, Spruce, Southern Yellow Pine, Western Red Cedar, White Cedar, Alaskan Yellow Cedar, Redwood, Oak, and other domestic species, as well as all of the durable hardwoods. The major construction species of durable hardwoods being imported are Ekki/Bongossi/Azobe, Mora, Greenheart, Purpleheart, Black Kakaralli , Bethabara/Ipe, Dinizia Excelsa, Cumuru, Wallaba, Angelique/Basralocus, Jatoba, Angelim Pedra, many others are available to facilitate different requirements.